An EAN 8 is a barcode derived from the longer European article number code (EAN-13). It was introduced for use on small packages for which an EAN 13 barcode would be too long; for example on cigarette packets, pencils or chewing gum packages. 2- or 3-digit GS1 prefix (assigned to each national GS1 authority). 4- or 5-digit reference element depending on the length of the GS1 prefix. The numbers are formatted as: 0xxx xxxx or 2xxx xxxx. 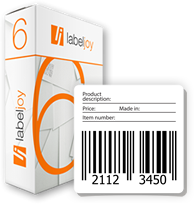 Labeljoy EAN 8 barcode generator requires you to enter 7 digits to generate the EAN-8 barcode. Enter the 7 digits in the text box and clic Preview: Labeljoy will show you if the Encoding for Ean-8 code is OK. The 8th digit (or check digit) is automatically calculated. EAN-8 barcodes can also encode 2 or 5 additional digits. Enter the additional digits in the right text box. For the main barcode, only the first 7 digits found will be considered. Enter 7 numbers in Labeljoy to generate the barcode. The 8th digit (or control digit) is automatically calculated.